It’s autumn, and it’s pumpkin season. I love this time of year, when pumpkins are in season, because I love pumpkin pie, cookies, scones, muffins, and the list goes on. 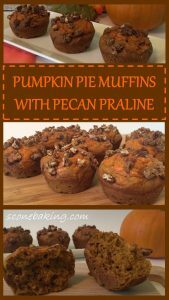 I’ve already shared my recipes for Pumpkin Scones, Pumpkin Chocolate Chip Cookies, and Pumpkin Macarons, but this year I am sharing my recipe for Pumpkin Pie Muffins with a Pecan Praline Topping. 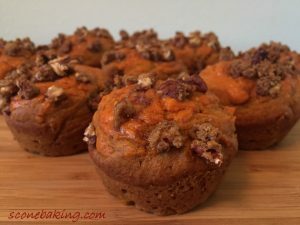 Yes, these delicious muffins have a pumpkin-cream cheese topping, which is like having a little pumpkin pie on top of your muffin. 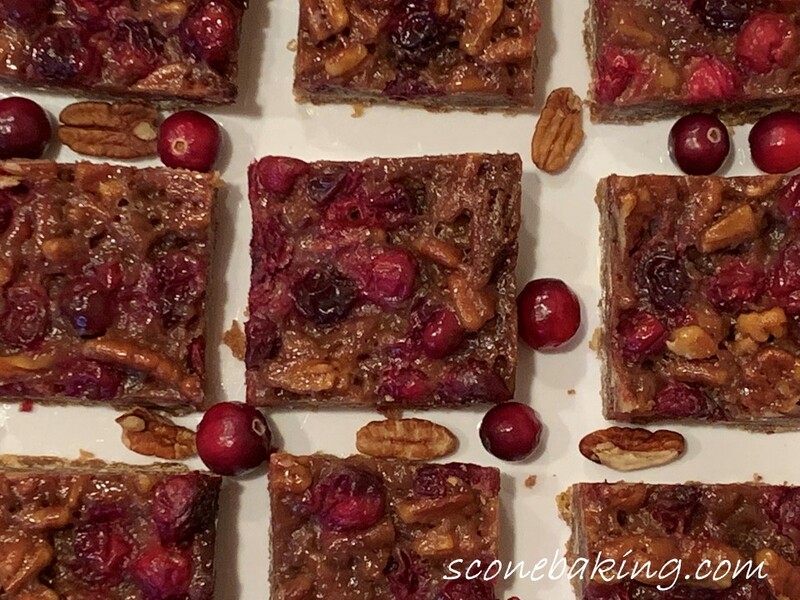 Then, I also added a yummy Pecan Praline Topping, to add a little pecan crunch to the muffins. 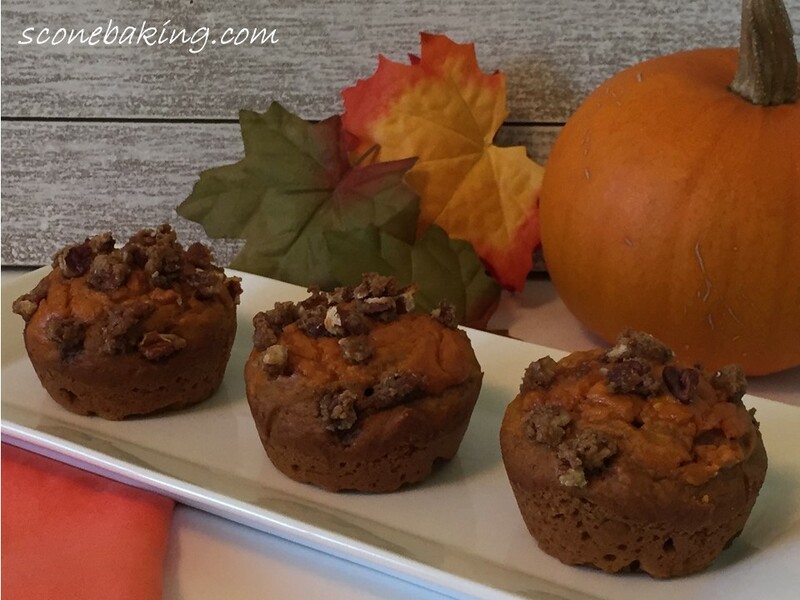 I also like the way pumpkin pie spice adds a little warmth to these muffins. 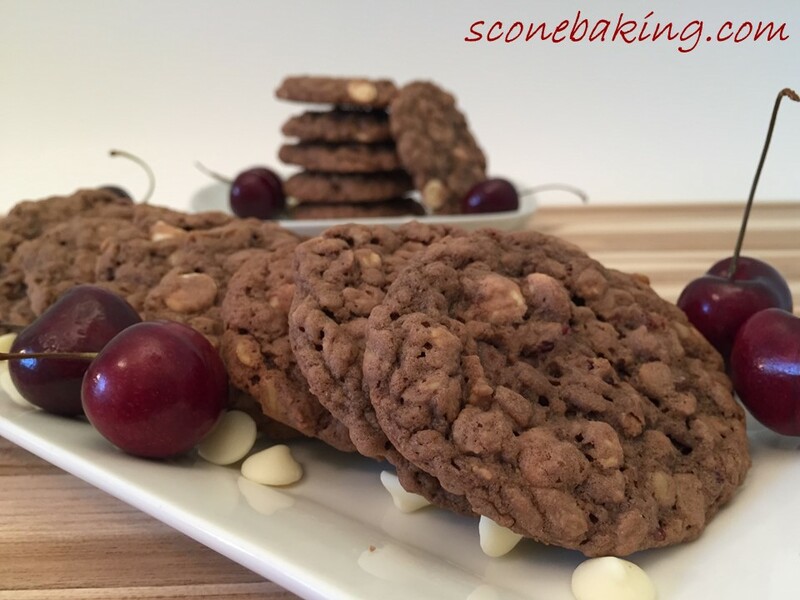 In a small skillet, on medium-low heat, toast pecans, about 3 minutes; stirring constantly. Stir in 3 Tbsp. brown sugar, corn syrup, and pinch of salt, heat through until sugar is melted, about 3 minutes. Remove from heat, stir in vanilla extract. Set aside. In a medium bowl, combine 4 oz. pumpkin puree, cream cheese, sweetened condensed milk, egg yolk, 1/4 tsp. pumpkin pie spice, 1/8 tsp. salt; whisk together until smooth. Set aside. Preheat oven to 350º F. Coat a 12-cup muffin pan with cooking spray. In a large bowl, whisk together the flours, baking soda, 1/2 tsp. salt, and 1-1/2 tsp. pumpkin pie spice. In a medium bowl, whisk together the 3/4 cup brown sugar, buttermilk, oil, 2 eggs, and 1 cup pumpkin puree until smooth. Mix the buttermilk mixture into the flour mixture, stirring until just combined (it will still be lumpy). Fill 12 prepared muffin tin cups evenly with about 1/3 cup of the muffin batter. They should be about 2/3 full. Top each muffin with 2 tsp. of the Pumpkin-Cream Cheese Filling. 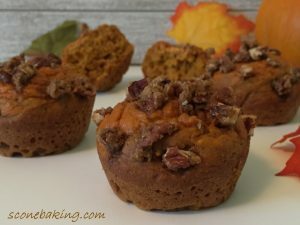 Take a toothpick or skewer and swirl pumpkin-cream cheese filling slightly into muffin batter. 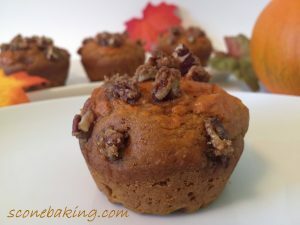 Sprinkle each muffin with the Pecan Praline, pressing down slightly. Bake at 350º F. for 25 minutes or until a wooden pick inserted in center of the muffins comes out clean (or internal temperature of 205ºF-210º F.). Cool on a wire rack lifting each muffin to release the steam (this helps to prevent soggy bottoms). After 15 minutes, remove muffins from pan; finish cooling on the wire rack.